Form 1120S is the annual tax form used by S-corps and LLCs taxed as S-corps to report their net earnings to the IRS. Similar to partnerships, net earnings pass through to the S-corp’s shareholders. Shareholders report their share of the S-corp’s earnings on their personal tax returns. You can download Form 1120S and prepare the return manually. However, we recommend that you use a tax software, such as TurboTax, instead. Using software can make preparing 1120S more accurate and complete by importing data from QuickBooks and checking the return for errors. Start your taxes for free, and pay only when you file. Whether you hire a tax professional to prepare your taxes or you use tax software, you will need information and documentation to complete 1120S. The information includes financial statements and details about your shareholders. Download the Form 1120S Checklist as a PDF. Details about your S-corp or LLC: The name of the business, the date the S-corp incorporated, the date of your S-corp election, employer identification number, and mailing address. Tax year: Whether you are filing on a calendar year or fiscal year. Business activity: Briefly describe the business activity of the S-corp, the main product or service you offer, and business activity code that reflects your industry. A complete list of business activity codes is found in the Instructions for Form 1120S. Shareholder information: The names, addresses, tax identification numbers, and percentage of ownership for each and every shareholder. Ask shareholders to provide you with Form W-9 as well. Profit and Loss statement: Also known as an income statement, this financial report summarizes the income and expenses of the S-corp for the year. You can generate a profit and loss report in QuickBooks quickly and easily. Balance Sheet report: This financial statement summarizes all assets, liabilities, and owner’s equity as of the end of the tax year. If you use QuickBooks, running a balance sheet report takes just a couple of minutes. Accounting method: The two accounting methods are cash and accrual. Most S-corps use the cash basis method of accounting. To learn more about the accounting methods, check out our guide on the cash versus accrual method. Fixed asset purchases report: Print out a report showing the details of every purchase of equipment, machinery, buildings, vehicles, and other fixed assets. This detail is very useful when figuring out the S-corp’s depreciation deductions for the year. You’ll need to know the date of purchase, the date the equipment was first used for business purposes, the purchase price, any installation costs or substantial improvements, and the type of equipment or asset. Payroll expense report: Print out a report showing compensation paid to each employee of the S-corp for the tax year. Highlight which employees are officers of the S-corp. This detail will be useful because compensation for officers is reported on a separate line item from salaries and wages paid to other employees. Forms 1099: Did your S-corp need to file any Forms 1099, such as for independent contractors? The Form 1120S asks this question, so it’s best if you double-check. Our article on Form 1099 reporting can help you figure out if you are required to issue any 1099s. As you can see, you’ll need several reports summarizing the financial activity of your S-corp during the year. If you need a better way to keep track of all this data, consider using QuickBooks. Get started today and save 50% off the first three months of service. The first few line items of 1120S are very straightforward. 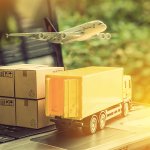 You’ll provide the name of the S-corp or LLC taxed as an S-corp. You will also indicate the mailing address, employer identification number, incorporation date, S-corp election date, and business activity code. IRS Form 1120S general information such as name and EIN. Fiscal year: If the S-corp has adopted a fiscal year, indicate the dates for the beginning and end of the fiscal year in the line above the name. S-corp election date: If you are filing the S-corp election (Form 2553) with 1120S, you may need to write or to type special words in the blank space in the top margin. See the Instructions for Form 2553 for details. Business activity code: This is a six-digit code representing your industry. Business activity codes are found in the Instructions for Form 1120S. 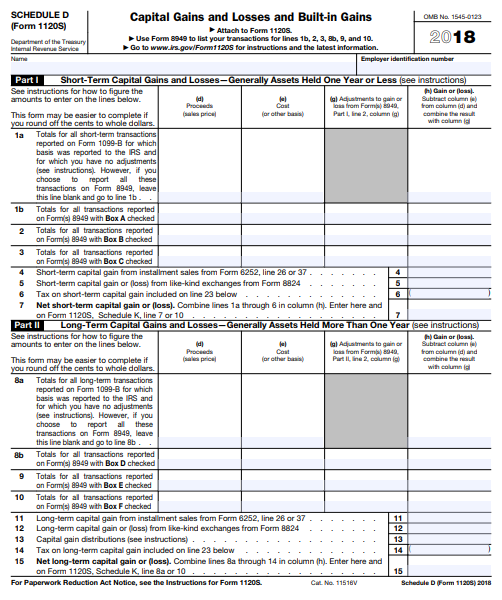 Item C: Small and mid-sized business with total assets less than $50 million at the end of the tax year do not need to file Schedule M-3, and thus do not need to check the box on Item C.
Item F: You may want to fill out Item F (total assets at the end of the year) after preparing Schedule L (the Balance Sheet). Item H check boxes: Check any boxes that apply. If the S-corp dissolved, and this is the last year the S-corp is filing a return, check the Final return box. If the S-corp is filing another return to revise or correct a previously filed return, check the Amended return box. 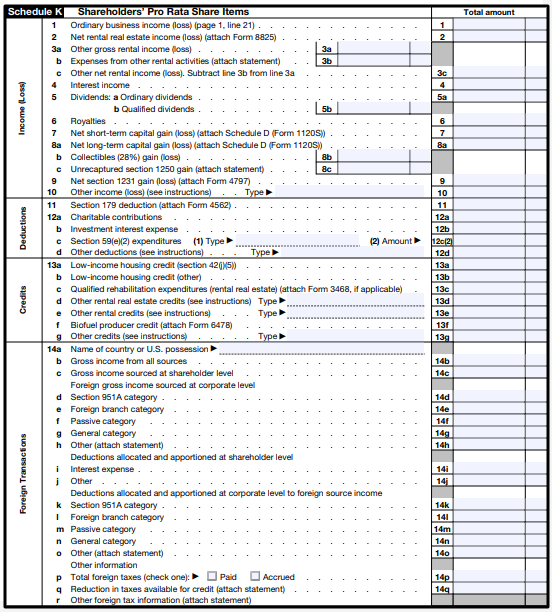 On the first page of Form 1120S, the S-corp reports its income and deductions for the year. Refer to the S-corp’s profit and loss statement when filling out Lines 1a through 21. Some line items require supplementary forms or statements to provide additional detail, such as Line 19 for Other Deductions. IRS Form 1120S reports income and deductions of the S-corp.
Income: Show ordinary business income on Line 1a and gains or losses from the sale of business assets on Line 4. Rental income, interest, and investment income are reported on Schedule K on page 4. Compensation of Officers, Salaries, and Wages: You’ll need to separate out how much was paid to officers of the S-corp (Line 7) and how much was paid to all other employees (Line 8). The S-corp may need to detail officers’ compensation on Form 1125-E if the S-corp’s total receipts for the year were at least $500,000. Taxes and Licenses: Line 12 includes state income taxes, state franchise taxes, business property tax, county and city taxes, payroll taxes, city business licenses, and business registration fees. Interest Expenses: New for 2018, the amount S-corp’s can deduct for interest paid on loans is now limited. Use Form 8990 to calculate how much interest paid you can deduct. Depreciation: Use Form 4562 to work out how much the S-corp’s depreciation deduction should be on Line 14. You will need to refer to the S-corp’s fixed asset purchases report to calculate depreciation. Pension, profit-sharing, etc., plans: Show on Line 17 contributions to 401(k) plans, SEP-IRAs, and similar group retirement savings plans. Employee Benefit Programs: Line 18 indicates the S-corp’s deduction costs for health insurance benefits, group term life insurance benefits, and meals and lodging provided for the convenience of the employer. Refer to the IRS Instructions for Form 1120S for the special rules on how to handle health insurance benefits for shareholder-employees. Other Deductions: Detail on a separate statement any deductions that don’t fit into any of the categories shown on Line 2, or Lines 7 through 18. Examples of other deductions include travel, telephone service, or postage. Be aware that starting with the year 2018, businesses can no longer deduct entertainment expenses. Fines and penalties cannot be deducted. And only 50% of business-related meals can be deducted. Did you know that tax professionals can pull QuickBooks data into their professional tax software? Set up properly, this can reduce the amount of time spent entering data into tax software and make the tax preparation process go smoother. The purpose of this section is to calculate federal taxes that apply if the corporation was previously a C-corp or engaged in a tax-free reorganization with a C-corp. In this section, you will list the estimated taxes paid during the year and overpayments applied from the previous year. Tax and payments section of IRS Form 1120S. Excess net passive investment income tax: This tax applies when an S-corp used to be a C-corp and the S-corp’s net passive income is more than 25% of its gross receipts for the year. Built-in gains tax: This tax applies when an S-corp used to be a C-corp, the C-corp acquired an asset, the S-corp sold the asset, and the asset increased in value. Schedule B of 1120S consists of 15 questions that require a yes/no response. The questions cover a wide variety of topics, such as whether the S-corp owns stock in other corporations or partnerships, or whether the S-corp has issued restricted stock. The Form 1120s instructions discuss the issues involved. IRS Form 1120S Schedule B. Question 11 has two parts. The purpose of these questions is to figure out whether you need to complete Schedule L (the balance sheet) and Schedule M-1 (to reconcile book income to the tax return). If you can answer Yes to both questions, you do not need to fill out these schedules. Question 11 of Schedule B (IRS Form 1120S). Total Receipts: This refers to gross receipts (line 1a of page 1), all other income as reported on page 1, Form 8825, and Schedule K.
Total Assets: This means the total book value of the S-corp’s assets at the end of the tax year. S-corp-s report any capital gains or losses on its investment portfolio on Schedule D. This specifically relates to the gains and losses you incurred from the sale of stocks, bonds, mutual funds, and other securities. The net amount of capital gains is reported on Schedule K, and then allocated to each shareholder’s Schedule K-1. 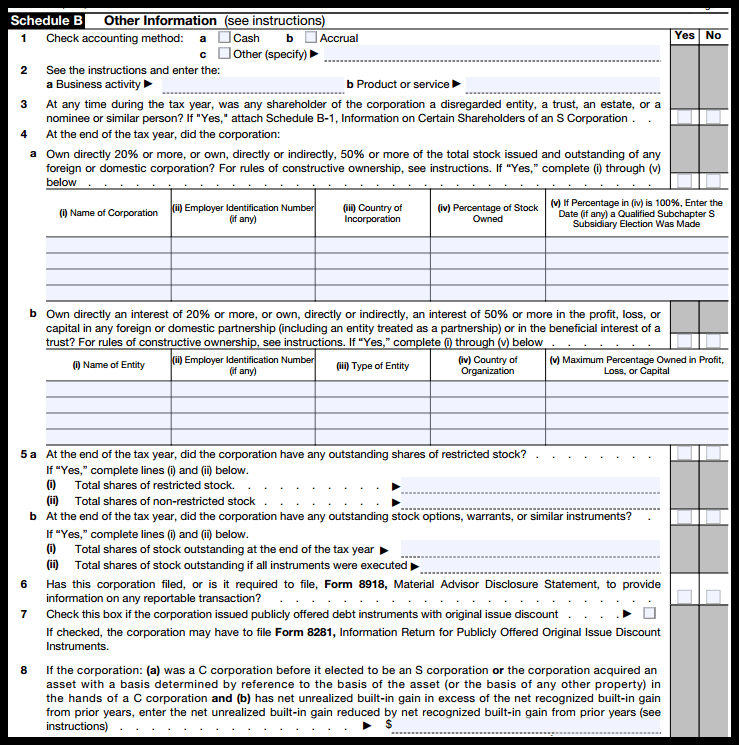 IRS Form 1120S Schedule D summarizes the S-corp’s capital gains. Built-in Gains Tax: If the S-corp used to be a C-corp, the capital gains can be subject to the built-in gains tax or the tax on excess net passive income. See the FitSmallBusiness guide to S-corp taxes for details. Information needed for Schedule D: You will need to know details for each investment trade, including the date and cost to purchase an investment, and the date and amount of the sales proceeds. Use Form 8849: To report the details of each specific investment trade. Use Schedule D: To summarize the gains or losses by short-term and long-term holding periods, and to summarize the overall gains for the year. Short-Term Holding Period: Means an investment was owned by the S-corp for one year or less. Long-Term Holding Period: Means the S-corp owned the investment for more than one year. Where to Find the Instructions: The IRS provides the Schedule D instructions separately from the main 1120S instructions. Schedule K is a summary of the S-corp’s net business income, investment income, deductions, and credits for the year. Information for Schedule K comes from page 1, from Schedule D, from the profit and loss statement, and from various other tax forms. Schedule K (IRS Form 1120S). Amounts from Schedule K are allocated to each shareholder based on percentage of ownership. Prepare one Schedule K-1 for each shareholder. The amounts reported on each shareholder’s K-1 is the amount from Schedule K multiplied by the shareholder’s percentage of stock ownership for the year. Schedule K-1 (IRS Form 1120S). 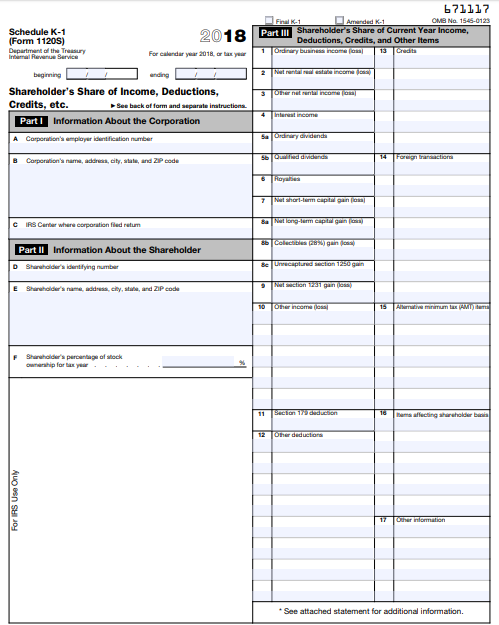 Allocating to shareholders: Each shareholder of the S-corp will receive a Schedule K-1 (Form 1120S) based on their percentage of stock ownership. For example: Suppose an S-corp has two shareholders. One owns 60% of the stock and the other owns 40% of the stock. Then the amounts from Schedule K are allocated 60% to the first Schedule K-1 and 40% to the second Schedule K-1. Furnish Schedule K-1 by due date: The S-corp needs to give a Schedule K-1 to each shareholder by the filing deadline (March 15th, or September 15th with an extension). Amounts flow from Schedule K-1 to Form 1040: Shareholders take the amounts shown on their Schedule K-1 and report it on their personal tax return. Pass-through nature: This allocation process is how S-corp income, deductions, and credits pass through to the shareholders’ personal tax returns. The purpose of Schedule L of Form 1120S is to provide the IRS with details of the assets, liabilities, and equity of the S-corp. The information for Schedule L comes from the S-corp’s Balance Sheet report, which can be quickly printed if you use a software program like QuickBooks. You will need one balance sheet report for the current year (end of tax year columns) and another balance sheet report for prior year (beginning of tax year columns). You don’t have to file out Schedule L if you answered “yes” to questions 11A and 11B in Schedule B. 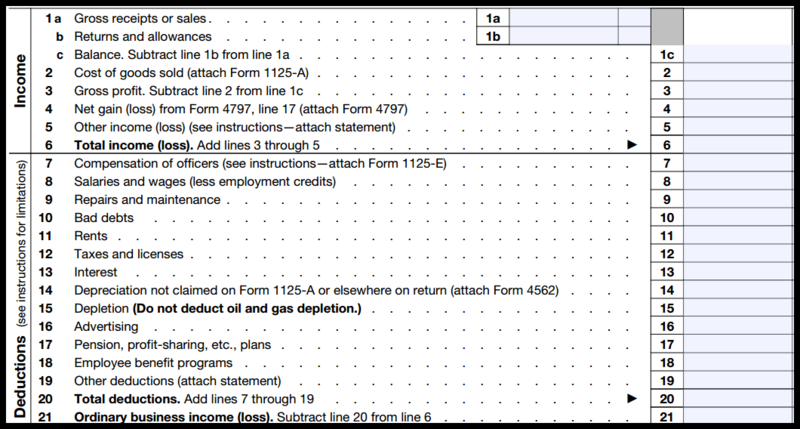 Schedule L balance sheet for IRS Form 1120S. 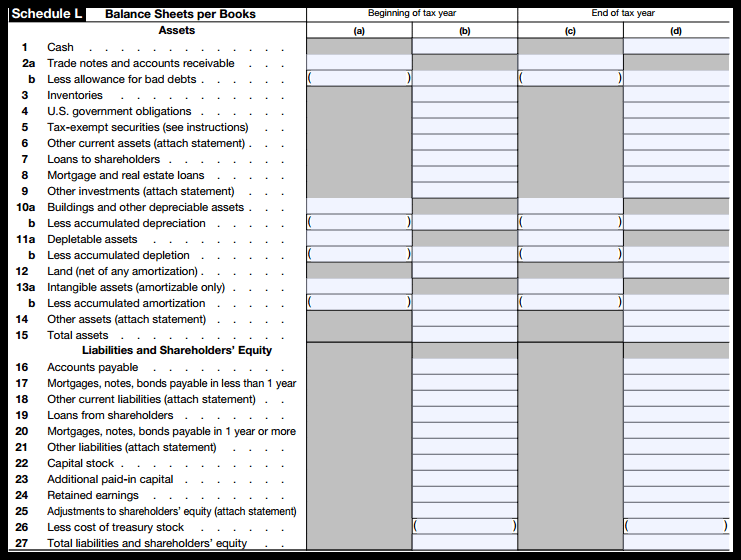 Balance Sheet Same as Books: Schedule L should agree with the S-corp’s balance sheet for financial accounting purposes. This is important because the balance sheet provides valuable information about the assets owned by the S-corp and capital invested by shareholders that is missing from the income and deduction section. Schedule M-1 reports any differences between the S-corp’s profit and loss report and its income and deductions for tax purposes. For example, one common difference between the books and the tax return is depreciation (you might use straight-line for book accounting, but MACRS for tax purposes). Schedule M-1 for IRS Form 1120S. Depreciation: You might use straight-line depreciation for your books, but MACRS or the section 179 deduction on the S-corp tax return. Meals: You report 100% of meal expenses on your profit and loss, but can only deduct 50% of that amount on Form 1120S. Tax-exempt interest: Interest from municipal bonds is recorded on the S-corp’s profit and loss statement, but it’s exempt from tax on Form 1120S. The purpose of Schedule M-2 is to show changes in the S-corp’s accumulated adjustments account (AAA) during the tax year, which is essentially your retained earnings in the company. The AAA balance at the end of the tax year is how much money you have in the S-corp that can be reinvested into the business or distributed to shareholders. Schedule M-2 for IRS Form 1120S. AAA starts at zero: On the first day the corporation is an S-corp, its AAA is zero. Income increases AAA: All items of income increase AAA other than tax-exempt income. Expenses decrease AAA: Expenses (other than expenses related to tax-exempt income) decrease AAA. Distributions to shareholders: Both in-kind property distributions and cash distributions decrease AAA. Negative balance: AAA can have a negative balance, which can happen if an S-corp has been operating at a deficit. Accumulated earnings and profits: The amount in column C refers to earnings and profits if the S-corp used to be a C-corp. When in doubt: The Form 1120S instructions outline specific rules to follow when calculating AAA. In this article, we have discussed how to complete Form 1120S, the tax return for an S-corp. There is much more that can be said. Below we answer some questions that come up frequently about the S-corp tax return. If you have a question, feel free to post your question in the FitSmallBusiness Forum, and we’ll get back to you with an answer. What is the due date for filing Form 1120S? The due date for filing Form 1120S with the IRS and furnishing each shareholder with Schedule K-1 is March 15th for calendar year S-corps. Fiscal year S-corps file their Form 1120S by the 15th day of the third month following the end of their fiscal year. S-corps can request a six-month extension. How often is form 1120S required to be filed with the IRS? S-corps file 1120S once per tax year. S-corps are required to file Form 1120S with the IRS for each and every year they are legally in existence, even if they didn’t earn any money. How do I amend my 1120S tax return? To amend a previously filed Form 1120s, the S-corp fills out a new form and marks the box on line H to indicate this is an amended return. S-corps will also need to provide shareholders with copies of the amended Schedules K-1. A detailed explanation of changes should accompany the amended 1120S tax return. Do all S-corps have to complete Schedule M-2? Maybe. If an S-corp does not have accumulated earnings and profits from years when it was a C-corp, then the S-corp does not need to complete Schedule M-2. S-corps may want to calculate their AAA in case they need this information in the future. You should now have a pretty good idea of how to complete Form 1120S, and where that information is found in the S-corp’s financial reports. Work through the 1120S tax return carefully, and keep copies of your work. If you have questions, ask for help. Also, consider using TurboTax, which can import data directly from QuickBooks to speed up preparation of your Form 1120S. There’s the shareholder aspect to consider as well. If you need to calculate shareholder basis there’s a new tool called BasisCalc (https://basiscalculator.com) that will do it for you. Todd, thank you for sharing his information with our readers! s corp assets? line f. What is an asset? Is money in the bank a part of assets? or is it touchable items? Do all S-corps have to file a schedule m-2? Hi Dee, to my knowledge you must complete schedule M-2 if you are filing Form 1120S. The purpose of Schedule M-2 is to reconcile undistributed net income of the S corp. Adjustments are made in this section for income and distributions that took place during the tax year. The balance at the end of the tax year is how much money you have in the business that can be reinvested in the business or distributed to shareholders.